UHI – worse than we thought | Watts Up With That? Remember when I measured the UHI in Reno, NV? It seems the normally alarmist “Climate Central” is just now getting around to recognizing UHI, but of course, they have to put in the obligatory disclaimer that it cannot possibly contribute to the global warming signal. Well, they are just flat wrong about that, but that’s what they are paid to say. Since 1970, summer temperatures have been rising. While exact rates of warming differ between regions, most cities have been heating up faster than adjacent rural areas all across the United States. The concrete and asphalt surfaces in city buildings, roads, and infrastructure hold more heat and release that heat more slowly than vegetation and organic surfaces. This is known as the Urban Heat Island (UHI) effect. Climate change then takes that heat and makes cities even hotter. In a new report, Climate Central analyzes how UHI and climate change have affected 60 of the biggest American cities since 1970. The study examines the difference between average summer temperatures in urban areas and nearby rural areas. Some cities had much higher temperature differences: 23 different cities experienced single days that were an astonishing 20°F warmer than the rural areas around them. With more than 80% of Americans living in cities, these urban heat islands, combined with rising temperatures caused by increasing heat-trapping greenhouse gas emissions, can cause serious health effects for hundreds of millions of people during the hottest months of the year. Heat is the number one weather-related killer in the United States, and the hottest days, particularly days over 90°F, are associated with dangerous ozone pollution levels that can trigger asthma attacks, heart attacks and other serious health impacts. The study ranks the 60 cities by the intensity of their heat island effect, shows how heat drives air pollution (ozone levels) in nearly every city analyzed, lists cities that have far more days over 90°F than adjacent rural areas, and shows how most cities are warming faster than the surrounding rural areas. Urban heat measured by satellite in Louisville, Ky. Click image to enlarge. Several independent studies have shown that urban heat islands (in the U.S., and around the world) do not bias global warming measurements, ruling out the possibility that rising global temperatures have been caused by urbanization alone. Research suggests that urban planning and design that incorporates more trees and parks, white roofs, and alternative materials for urban infrastructure can help reduce the effects of urban heat islands. But rising greenhouse gas emissions are projected to drive average U.S summer temperatures even higher in the coming decades, exacerbating urban heat islands and their associated health risks. August 20, 2014 in UHI. OMG! So Global Warming is obviously worse in the cities!!! Where most of the people live!!! If you just watched the 11 pm local news, you knew all about this. In Baltimore, where I grew up, city temps were always higher than surrounding Baltimore County. Indeed, the county often saw material snow accumulations during the winter, with little to none in the city. I experienced this effect vividly in the early 1990s, when I lived in a brick building in Portland, Oregon. It became an oven at night in summer. The surrounding countryside by contrast could be downright cold after the sun went down. When I flew into Vegas last month, it was 113 F at 9 PM. The surrounding desert was cooler enough for the plane to be buffeted by the thermal differential. I have lived in Reno for 42 years. Believe me, Reno is no hotter than it was in any of the last four decades. Everybody here knows the Reno airport’s official weather station is the hottest place in the metro area – and why wouldn’t it be? The airport was built on a drained lowland wetland, essentially the lowest place around, and is now surrounded by hundreds acres of concrete, buffeted by jet aircraft exhaust, and also sits adjacent to a busy six-lane freeway. My home outdoor thermometer, only two miles from the airport, reads consistently four degrees cooler than the official Reno temperature. It is bad enough this contributes to the warming fantasy, but the adjustments for it are in the same direction, warmer. Can you guys comment on the BEST papers and how they claim that these UHI account for little if not none of the recorded warming? Its obvious to me that UHI is a real thing, but what impact does it really have on the average warming trend, (or is warming still shown even with the UHI)? Shouldn’t it be mentioned somewhere that this UHI needs to be backed out of the thermometer data when trying to show the primary and secondary effects of CO2 on climate change? It should also be pointed out that during bitter cold winters a little UHI (like incandescent lights) can be a good thing. My expensive LED lamps do nothing to blunt the chill of Old Man Winter. I still have yet to be convinced by any study that removes UHI as a contributor to the observed warming over the past 150 years. The longest running sites are all based in and around the largest cities worldwide. This is not just a US phenomenon and anyone claiming such has not looked at the station sites. Ask why the warmist make UHI adjustments to current and past data when they build their models to support their alarmist position. If ” Heat is the no. 1 weather -related killer in the US”, why do the actual death statistics show that more people die in Winter? Or is this merely normal post-modern science? Frost Warnings have been issues for areas outside the city….a normal weather release in the fall….repeat each year! Everyone agrees that the little warming the Earth has experienced over the past 150 years or so is very much concentrated in the northern hemisphere, where almost everyone lives and the vast majority of cities and towns lie. However, the devout warm-mongers continue to deny the connection. Anthony, I trust your are going to challenge the absurd assertion by Climate Central that the analysis of UHI is their original work. Any motorcyclist knows all about UHI from practical experience. Perfectly comfortable in the city, freezing to death ten miles outside of town. we’ll just adjust up for that………….. Nothing new here. In the 1920’s, when it was hot in the summer, it was common for the “City folk” to take the streetcars to a large park (Swope Park, Kansas City, Mo.) south of the inner city to sleep… with mattresses and kids in tow. It’s obvious BEST got it wrong on UHI. IIRC, they pretty much dismissed UHI out of hand with investigating it. Anthony’s surfacestation.org project shows that even climate reporting stations outside urban areas are being affected by local siting issues. The more we learn about UHI, the more we know that the models underestimate it. this is why meteorologists (at a higher percentage anyway) don’t believe in this GW crap. The real irony about UHI and climate change is that many “smart urban planning” guidelines seek to get rid of the suburbs and place more people in dense urban environments. Given how much greater UHI trends are than global temperature change, the urban planning “remedy” will subject people to 3x more warming than if they lived in the suburbs. That’s because they don’t really care about people, they want them where they can control their lives. People need to fight these ‘planners’ so that they can retain the freedoms they are accustomed to. Ronan Connolly has an excellent paper here, explaining how the GISS procedure for adjusting for UHI is wholly inadequate. Reno should be a poster child for UHI. The Reno/Sparks metro area experienced an explosion of growth and urbanization since 1970. The airport runway and taxiways have been much expanded and areas around the airport perimeter have been developed from what was farmland. The adjacent freeway has been widened considerably. Of particular interest is the huge Grand Sierra Resort complex (originally the MGM Grand Hotel) which was built adjacent to the airport in the mid-70s, adding 25 acres of asphalt plus a Vegas-scale casino/hotel. Your graphic triggered a long-dormant memory from the early 60s of James Blish’s ‘Okie’ SF novels. Coincidence, or similar tastes in reading? The heat from UHI either makes the climate warmer or it doesn’t. If I remember correctly, the most recent paper on UHI and global warming found that since UHI had only increased by about 0.01C over the last century, there was no need to adjust city based sensors for UHI. there is no [measureable] AGW and there is no [measureable] UHI either, when looking at a reasonably sized global sample of weather stations. Man, climate change is something else, ain’t it? Stalking around like that, looking for heat to grab. So this would be excuse # 35? Funny how heat is blamed for the winter rise in mortality. Is it a negative function? Rising heat leaves more people vulnerable to freezing to death? Any commuter with a air temperature sensor in their car, knows the UHI effect. Ditto all motorcyclists. I wonder, what other “pause creating factoids” will be rediscovered by these geniuses? what has happened to my name? Is this from my computer or from your web-host? Sorry, but it is not that simple. There are three issues; viz. 3. the determinations of global average surface temperature anomaly (GASTA). UHI is an obvious alteration to the local climate. The region surrounding an urban area has a cooler climate than the urban area. UHI is a trivially small effect on global climate. The area covered by urbanisation is a tiny proportion of the Earth’s total surface area. The UHI warming is localised to urbanised areas and is an indiscernible increase to the average temperature of the Earth’s total surface area (ignoring that temperature is an intrinsic property so has no true average value). UHI is a significant effect on determinations of GASTA. That slide shows a mashed-up skyline of downtown Indianapolis! 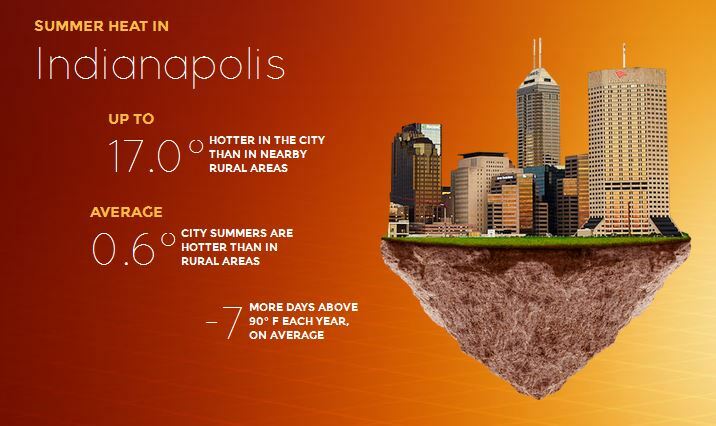 Looks like even a land-locked city like Indy can be an “island” when it comes to anthropogenic (due to pavement & thermometers) “local warming”. Ancient Rome was a city of some one million people that stretched for some 50 miles. UHI was well known and after the great fire Nero ordered that it should be rebuilt with narrower streets and higher buildings to create shade. There is probably some logarithmic progression in temperature build up compared to population/amount of built up area. However at some stage! no matter how built up the area becomes, it will not warm any further. In consequence the uhi affected area spreads from a small central area of the city right into the densely built suburbs. As many of the worlds thermometers are located in growing urban areas you would expect them to get progressively warmer up to a point and for this to be reflected in global temperatures. The general discussion is just vague enough that methodology hangs out there in the foggy fringes of clarity. They say that they adhere closely to the methods advocated by three earlier studies, none of which identified any strong UHI influence on the estimate of change in mean global temperature through time. They did identify regional trends, for instance in the southeastern US, where urban temperatures were trending downward. I believe that trend affects about one third of the urban temperature records in the USHCN. The remainder show warming. The real problem from a methodological view is that few if any discussions, address the genuine realities of where temperature data is collected. Even “rural” land is affected by human land use. Rural weather stations are primarily associated with agricultural communities. That means that even those stations are subject to an anthropic signal. Further, anthropic changes in rural regions may be in more than one direction over time and quite possibly greater than comparable urban changes. Early land clearing for example would elevate base temperatures so that when the weather stations were finally established, the area was already experiencing an elevated temperature compared to the pre-agricultural past. A shift from say unirrigated winter wheat to summer rice in flooded paddies would significantly change readings in several possible ways. The land clearing and ploughing to grow wheat would initially increase heat measures, decreasing albedo and increasing evaporation rates. A shift to irrigated rice paddies would dampen temperature swings due to evaporation while the paddies are flooded which would tend to cool things during the day, but keep them warmer at night. They also would behave more like normal dry croplands later when the paddies dry, resulting in possible seasonal shifts in temperature patterns and trends. Anyway. there should be a rural effect that I do not see any serious attempt to address. I could easily be mistaken but I am sure that no “rural” corrections are made in any model I have read about. Until the advent of USCRN in the early 21st century, data from actual wild lands was a very minor component of the US temperature record. And please mark that only in wild lands can a clear baseline of natural temperatures (and thus climate theoretically) be acquired. So, the short of it for me is that no available “climate” study based on historical weather data has a shot at yielding a trustworthy model of “climate” trends. All that humans experience is weather on a day-to-day basis. All that our weather stations record is weather data, again on a day-to-day basis. Even tree rings and varves are “records” of weather, not climate, since even trees respond to weather changes rather than “climate,” and varves only respond to changes in erosion. Climate cannot logically be shown to exist independently of weather. Climate is always a generalization OF weather. The idea that climate actually determines weather remains completely and absolutely an unproven inference. There is quite seriously no scientific grounds for even implementing a concept of “climate” scales where finer-grained weather data and proxies are available. The smallest time scale at which a concept of “climate” might be even remotely useful is in scales of 10,000 years or greater. Even then climate remains a gloss for really coarse grained information about weather over long time spans. Back in September 1995, we had some unusually cold air headed into the Cornbelt. The corn and especially the soybean crop was not yet mature and temperatures below freezing would do quite a bit of damage which would reduce yields and the crop size(supply). I had already made a chunk of money being long soybeans a week before the freeze as the market price spiked higher after updated weather forecasts became increasingly cold. On the Friday before the weekend with the coldest air that would hit, I decided that the market was still under priced and was not anticipating enough damage from temperatures that I figured would be cold enough to end the growing season in some areas of Illinois and Indiana, where the soybeans were still green and not mature. The markets were closed back then until Monday morning. The opening price would reflect actual damage or lack of it. I was up early on Saturday morning and first checked our local National Weather Service temperatures, here in Southern Indiana, a location that was effected by the expected freeze. I was horrified. The low was 39 degrees F. I knew it got colder in the outlying, rural areas, where all the soybeans are grown but my first impression after seeing 37 degrees was that it meant a big loss on Monday morning. 1995 had been a very dry Summer(extremely dry soils were one factor in why I thought temps would bottom out lower than what the market thought). I went outside to water my rain starved garden with the hose hooked up to the outside faucet. We lived in the country, 3 miles north of the National Weather Service location at the airport. We were also on well water and had been having a problem with the well drying up. I turned the faucet on and no water came out. Dang, that’s all I needed. First losing money from a forecast that was too cold and now we don’t have any water…..again. I disconnected the hose and water gushed out………..what the? The water in the hose water completely frozen! That couldn’t happen unless temperatures were well below freezing for numerous hours overnight. I called a friend who had numerous farmer contacts and they all reported the same sort of thing. Actual thermometer readings at rural sites bottomed out in the mid 20’s F in a large area of Illinois and Indiana, even some low 20’s, while none of the official NWS thermometers dropped as low as 32 degrees F.
The exact same thing happened on Sunday morning. 37 degrees at the NWS, while the water in my garden hose outside was frozen. Turns out that this was a bit unique for several reasons. The ground was bone dry as mentioned earlier(top soil moisture was almost nothing). The air mass was cold and dry but we had ideal radiational cooling, with clear skies and calm winds both nights. The center of a surface high pressure system was right on top of us. Additionally, we had extreme cold air drainage taking place between high and low elevations. Here in Southern Indiana, the ground is pretty flat but we have plenty of hilly ground and lower lying spots. Since cold air is more dense, as the temperature falls under these conditions, it drains into the valleys and lower lying spots, with the higher spots staying as much as 10 degrees warmer, even higher by just 5 feet in some cases, causing an extreme vertical temperature inversion. In this instance, the inversion must have been incredible, with air at least 10 degrees colder hugging the ground in the low spots…….which is where may garden hose was located. Much of the soybean plants are close to the ground too. The NWS instrument shelter/Stevenson screen? 5 feet above the ground, as well as being on somewhat higher ground and also located within what you would call our small urban city. A few days later, an inspection of miles of soybean fields was very revealing. The high ground soybeans were still mostly green, the rest, especially those on lower ground and effected by the cold air drainage all turned black……they were dead. The soybean market opened higher on Monday, knowing that the above freezing temperatures over the weekend in the urban locations didn’t matter……….they don’t grow soybeans in the city!!! I understand. However, they make the statement that implies that UHI heat adds to the atmospheric heat after they previously say that UHI isn’t making the atmosphere warmer. At least, that’s what I got. If I’m the only one, then so be it. This is the real Man Made Global Warming and shows that the (s)warmies were right all along. Nice to see someone attempt to quantify the effect, but who on earth didn’t already know it to be a fact? I notice the authors paid the usual homage to AGW establishment interests. Always a good idea if you wish to get published. Stay after it, Anthony. I know you don’t do it for glory, but at least you will be able to enjoy the last laugh. AGW is like living under a fishnet. It reflects a small portion of the heat back to the ground. Base on quick calculations, the fishnet equivalent to the increase in CO2 of the last century would look like this: if the threads of the fishnet were 1/8 in. (3mm) wide, they would have to be spaced by around 8in(20cm) in both directions. I don’t think this kind of fishnet would make the nights much warmer. So it is safe to say that the increase in CO2 over the last century cannot have changed the diurnal temperature range by a significant amount. It is also interesting to see that months with snow cover often have higher daily max temperatures in cities. The snow often melts on the roof and a layer of warm air is created and it stops convection underneath. I have also seen temperatures get 5C higher day after day in summer because the warm air heated on the roof was pushed by a constant wind and convection was completely dead under it. Well, the present California, unprecedented mega drought, is having a disruptive technology emergence in Silicon Valley. Now I have often asserted, that the best kind of grass to grow for a front lawn, would be a nice slab of green concrete; hopefully colored through and through, so it would last forever; rather than just a paint job. So now all over the Valley , well Sunnyvale anyway, the water starved brown micro hay, is being dug out, and replaced, with mosaics of paving stones. They now run from the sidewalk / footpath, up to the very garage door. One house just across the street from me, had a lively crew of “immigrant” stone masons, who took a jack hammer to the footpath / sidewalk, and broke the whole thing up , into pieces of concrete, that a typical immigrant mason, could pick up by gloved hands, and put in the back of a truck for hauling to a landfill. Then the dust blower crew came in, and blew all the concrete pieces, too small to pick up, over onto my driveway, and all over my cars’ shiny paint. Next, a large cement mixer truck, came and poured a new concrete sidewalk, which the mason artisans smoothed by hand trowel, into their idea, of a new footpath, to merge with the mosaic tiled brickyard, that once was the front lawn (and pre garage addition). The new side walk set up over night, so, the next morning; crack of dawn, the jack hammer crew could return, and demolish the new footpath again, down to immigrant stone mason size. Meanwhile, the Mosaic artists, would restack the red and brown brick tiles, after the house resident, had ruled nyet, on the artistic design. So in about ten days overall, this sidewalk was dismantled, and re-poured, four times in all, that I counted, each time with an intervening dust blower encorpse, to re-decorate my cars. I’m guessing that the rock quwarriers, did the first job, sans any sort of city approval, or building permit; who needs a building permit ?? Well the instant replays, were probably for some sort of road code violations. And four times, the moasicticians, did actually reshuffle, and re-stack, and re-lay the tiled art work. So the last re-incarnation of this project, actually took place with the new residents, actually having moved in; in the interval, between the rock truck, leaving for the land fill, and the next arrival of the cement mixer truck. I really would like to know the full history of this project, and what the final grade was, that the immigrant Stone Mason students received for their project. Bottom line is; the home’s new water usage, is about the same, since the new residents , number more than the previous occupants, of the small lawned residence that use to be there. No doubt, the house flipper, on this deal, made a killing. The start up stone masonry, likely will seek, whatever substitutes, for Chapter Eleven, in failed DIY enterprises. So this coming winter, should be warmer, due to the lawnless neighbor, and no need for evaporative cooling of his driveway artistry. It would be nice to get a couple of showers, to remove the speckled concrete new paint job on my cars. The concrete and asphalt surfaces in city buildings, roads, and infrastructure hold more heat and release that heat more slowly than vegetation and organic surfaces. This is known as the Urban Heat Island (UHI) effect. Climate change then takes that heat and makes cities even hotter. Let’s not forget about Residential / Building services power. I remember calculating New York City’s waste heat from a news article with Mayor Rudy G telling about 80% of the power going to building services and the amount. Worked out the square meters and the waste heat was around 35 W/m^2, back when the CO2 return was near 3 W/m^2. Later in the post a reply informed use that the city had a contract that a percent of the power (40%??) had to be produced in the city, so a lot of waste heat added to that number. So they only took 4+ years to learn what a 6th grader figured out and reported Dec 2009? Although there can be no doubt that these urban heat islands exist and are significantly warmer than their surroundings, it seems intuitively obvious to me that it is the *growth* and development of these urban heat islands that leads to measurable *warming*. Static long-established urban areas (e.g. Oxford, UK) may have a measurable UHI – but if it hasn’t grown or intensified significantly in time then there will not be much UHI-driven warming there. On the other hand, temperatures at a location (e.g. Heathrow, UK) that was a rural pastoral district 60 years ago and is now one of the worlds busiest airports around just two runways (and surrounded by urban sprawl) are going to include lots of UHI-driven warming. Rapidly expanding and developing UHIs = rapid UHI warming. So how much more Co2 is there in the air in cities than in rural areas? Is the concentration really enough to effect the temperature in Reno by 17 C in spikes, and .6C on average. Unfortunately they fail to mention that in the winter the UHI makes the cities warmer which is a huge benefit. I wish I had more UHI last winter when we were suffering with unbearable cold to the point where even with the furnace running constantly the house was too cold. $$$ in winter but less AC this summer so some balance in cost. Warmer in the winter is much more preferred especially since there are more cold weather deaths than hot!! Given the heat holding capacity of all infrastructure, be it of concrete, brick, steel, bitumen, wood, etc. etc. is many times that of air, and thus many many times that of the trace gas CO2 has anyone calculated the relative capacity of all global infrastructure existing today, including such things as the pyramids where the stone has been bought to the surface, as opposed to that of atmospheric CO2? The graphic at the top of the post seems confusing. 17.0 Degrees …is that Fahrenheit or Celsius? Also -7 Days…what does the negative number mean? You know, it occurs to me that only a myopic alarmist could claim that UHI does not contribute to global warming—when they claim that exact thing about CO2, when both achieve that effect by analogous mechanisms. The pavement/concrete absorbs solar radiation (both short- and long-wave, in the case of concrete and pavement), and then re-radiates it as long-wave radiation (ok, simplification, because depending upon albedo, parts of the ‘concrete jungle’ can reflect the short-wave). So does CO2. It is this exact effect of CO2 that is why the alarmists continue the hue and cry about it. If a trace gas like CO2 can bear such a huge burden of the warming for which man is supposedly responsible since the industrial revolution, then how much is mankind’s paving of the globe responsible for? To say none—as it appears the alarmists have been claiming—is disingenuous at best, obstinate stupidity more likely—denial, actually, in truth. Now—unlike them with their claims about CO2, I have never heard anyone of the Skeptic camp claim that there is some very high percentage of confidence that some percentage of all the warming since 1950 can be blamed on UHIE, but I think it’s been proven beyond doubt—how odd to discussing this here of all places—that so much heat collected to re-radiate through the nights in locales where surface temperature monitoring is also located will, ipso facto, skew the surface temperatures thus recorded, distorting the measurement, and effectively disqualifying that data for use in determining the mean global surface temp, lest it make it look like the earth is warming a lot faster than it perhaps is…QED. But again, if you look at it, for the alarmists to claim that CO2 plays a huge role in warming, and deny that UHI has any—not even the skewing of the data—is an incredible, fabulous double standard. There have been some studies previously. One I remember was an SPPI Original study by Dr. Edward Long. His study considered raw temperature readings, one rural and one urban station in each state. As I recall the difference was about .7̊F warming for urban stations. Also it seems to me the problem could be resolved if we just used the REAL rural stations for the climate change. A good example in the USCRN are the two stations near Stillwater, OK, one close to the city, the other about 3 kilometers further out in the rural area. The station closer to the city consistently reads 1̊F warmer. Also -7 Days…what does the negative number mean? 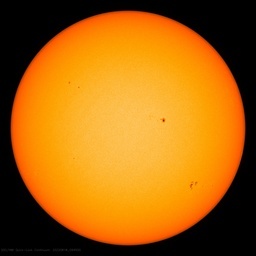 The UHI in Las Vegas is 7.3 F. Let’s assume no UHI only greenhouse effect. Assume 2 C per doubling of CO2. We have to quadruple CO2 to 1,200 ppm to get 7.3 F warming. Funny we worry more about GHE than UHI. 7.3 F warming is catastrophic! The gamblers are too busy to notice. I measure temperature in my garden in two places, one next to the house and the other in a secluded shady part. I can get up to 10C difference at times. Guess which one is the higher? The thermal band of Landsat provides insight on UHI. I have generated thermal maps of several large cities in the USA and Australia. The maps can be found at the URL below. I believe in global warming, but I think it is only in the cities. I live between two metro areas that are consistently 2-6 degrees F warmer than here at the house. Seems like a no-brainer to me…. 1. The number of stations that are in large urban areas is small. 2. almost half of the stations are in zero population areas. 3. The high figures you see in this post are atypical. Google UHI in large cities for a study of SUHI in 419 global large cities. 7F or 4F are for the worst days. cloudless, windfree days. Working on some better techniques to isolate the problem. In the end I may find something. The actual delta temperature claimed to be caused by CO2 is small too… we’re talking about small numbers blown up to create histerical conclusions. If you only used urban stations, there would barely be global warming to the degree BEST shows. Sorry but this Mosher post is disturbing to me. >1. The number of stations that are in large urban areas is small. Let’s take one line from this article and use it correctly. Over the last 10 years, the overall official “global” temperatures, which include these hot urban stations, have cooled slightly. But average summer overnight temperatures were more than 4°F hotter in cities [urban areas]. Is this admission that ONLY urban areas have warmed in the past 10 years. As if we didn’t know that?